When my 2010 Kindle died on the beach, I replaced it with the new Kindle Paperwhite ($139 with wifi and without advertising). This time I got a 2-year warranty to protect the fragile screen. Although I prefer reading real books at home, I like the Kindle for reading on the go and for digital galleys. I missed not having one when I was waiting for the new model to be released in October. The Kindle Paperwhite has some good new features. 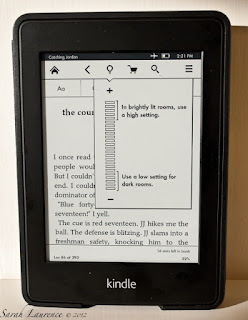 The reader still uses e-ink, but it has added a built in light for night time reading. The sharper text is illuminated sideways to avoid the eye fatigue of backlit screens. 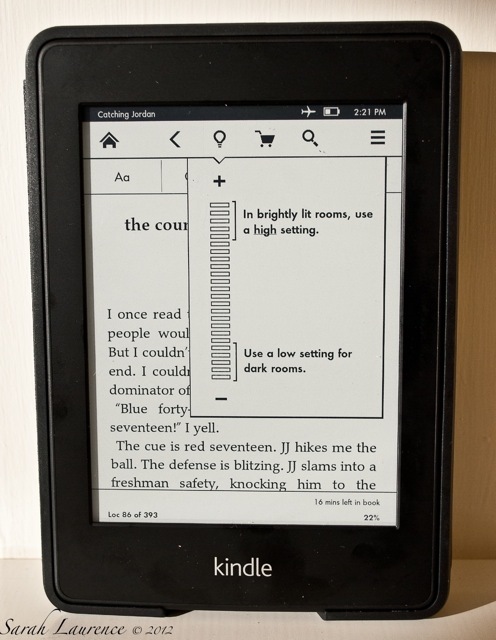 The lit screen appears bright white like paper, but you can adjust the lighting so the screen looks more like newsprint or the old Kindle. Unlit is easiest on the eye, but it's nice to have options. I thought I'd miss the old physical keyboard, but the new touch screen one is easy to use and the menu simple to navigate. The Kindle Paperwhite is also smaller and thinner without losing any screen size. Not all of the new features are improvements. I miss the old page turner buttons as it's too easy to skip a page accidentally with a touch screen. Another feature I dislike is the promotion of Amazon books on the home page (even in the "no advertising" models), but you can hide it by selecting to display "list view" instead of "cover view." All-in-all the pluses outweigh the negatives, but I wouldn't rush out and replace your old reader before it breaks. It bothers me that these ereader screens are so fragile. A book can last centuries. Because the Paperwhite is smaller than the Kindle 3 with keyboard, I needed to purchase a new case. If you had the later generation Kindle touch model, you might be able to reuse your old case. I tested three covers which would suit different reading needs. Amazon case is 1/2 inch; Durgadget stand and Verso cover are 1 inch thick approximately. The least bulky, lightest weight and most protective cover is the Amazon Kindle one ($39.99 available in 7 colors). It has the added feature of a magnet closure that automatically turns the reader on and off. This is a big plus as the on-off botton is tiny and hard to use. The rigid edges protect the Kindle on all sides while leaving an opening for the charger. The design is nice but a bit corporate in feel with good quality leather. The cover bends back for easy hand held reading but doesn't work as a stand. There is one major design flaw: it's really difficult to get the device in and out of the case. Since I like hands free reading, my personal favorite was the Duragadget Cover with Stand ($30.59 in 4 colors). It's adjustable and sturdy enough to sit in your lap while still providing good protection. Of all the cases I tested it was easiest to get the reader in and out of the case. It was also the cheapest. However the functional design and cheap leather were not especially attractive. I'm going to ask my daughter to decorate it with silver ink as a Christmas gift. For pure beauty I fell in love with Verso Marbled Blue cover ($39.99). The fake leather looks and feels real. The gorgeous Italian marbled paper design reminiscent of a journal bought in Florence. Even the spine has nice old book detailing. The biggest downside is the cover has no closure. Also it's extra bulky and awkward to hold when you bend the cover back (photo at right). It's best when held like a book in two hands. I'm tempted to keep this cover to dress up my Kindle just for fun. The Kindle Paperwhite is only two months old so I suspect more cases will be designed to fit the new dimensions better, but these three were the best options I found so far. When I ordered a Kindle Paperwhite for my mom earlier this week, it was on backorder until December 19th. No wait for books at our local independent bookstore, and they shall outlast the Kindle by decades. Reviewer's Disclaimer: all cases and the Kindle were purchased by me without compensation. I returned the cases I didn't like for a refund. Many thanks for the review. Hmmm... should I? Or should I not? That's always been the question in my mind ever since e-readers came into the market. Should I invest in one? I will at some point, I think. Especially for the reasons you said. Also, I can already begin to feel my eyes going funny. But, like you, I will still be reading proper books. ACIL, you aren’t the only one. When e-readers first came out, everyone expected them to be more popular with the younger techno-savvy generation, but it’s the over 40’s that are using them more since readers can adjust the font size instead of using reading glasses. I am waiting until my older model bites the dust. Great review! Sarah, thank you very much for commenting on my blog's width. I hadn't noticed! I think I made the template wider a few weeks ago when I posted that handwritten column because it spilled over the margins. But I forgot to amend it. I've done it now. Thanks a lot. This is a great review, Sarah! Thank you so much! I still don't have kindles but I've been thinking of buying one. I found the explanations on their cases very helpful as well because I'll have to buy one too. And I really enjoyed the latest Kingsolver. Thanks for the heads up. Barrie, just keep your Kindle away from four rowdy teens and one hyper puppy on the beach. It was probably not a natural death. ACIL, good to hear of the fix! I so enjoy reading your blog. Sapphire, I would have not guessed that Japan would be behind the US on technology. I wonder if reproducing Kanji complicates the process. Troutbirder, I’m so happy to hear that you enjoyed Kingsolver’s latest. I thought you would. One day you’ll have to explain how a “Luddite” got into blogging and digital photography. I have to admit that I'm addicted to the scent and feel of a real book too. I'm still using my first Kindle (the one with the actual keyboard), but I'm almost embarrassed to admit I'm addicted to a word game on there and use it more for that than actually reading books. I do like the ability to download a sample of a book, though. What bothers me is that, like computers, these models are made to be obsolete in a few years. Books are around forever. Sarah, I still resist these reading devices but it's interesting to read some both technical and practical information about them. If I ever change my opinion I may find them useful. I have had my eye on that Paperwhite version for a while now. Thanks for doing an informative review. I know I can trust you to give your honest, unvarnished opinion. My kindle, I don't remember which edition it was, but it had advertising and I got it around the same time you did, and it broke a couple months ago. I'm not sure if I should get a new one. I travel to Europe and Korea every summer and I usually bring a trunk full of books, but I can't decide if I should get a nook or kindle. Rose and Petra, nothing beats a real book but I like my ereader for travel and reviews. It all depends on your needs. I'll always love real books the most in the same way I like a real painting over a computer image. w2w, thanks, I'd let readers know if I received free products or compensation. I'm actually at a loss because the Crazy On Digital case, which had the wrong orientation (held the ereader horizontal) has not returned my email requesting a refund as of yet. To be fair I was beyond the normal return date but Amazon let me return the cases purchased directly from them. Be careful buying things from partner venders. Dabin, welcome to my blog! 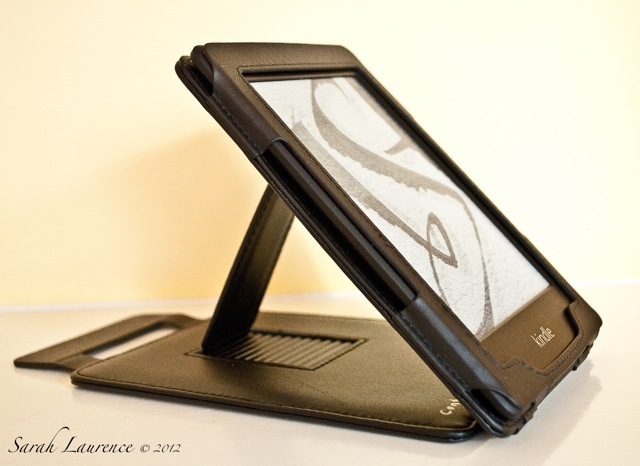 Once you buy a Kindle or a Nook, you are committed to that brand of ereader. 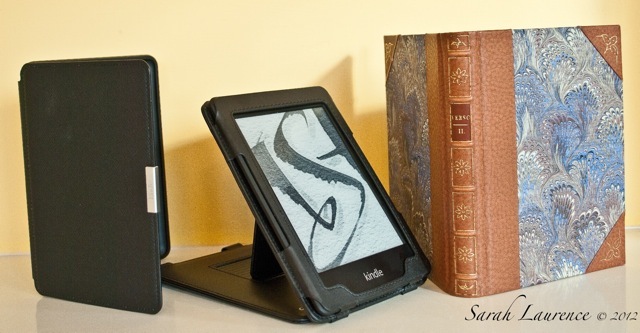 Your old ebooks from Amazon won't work on the Nook and vice versa. 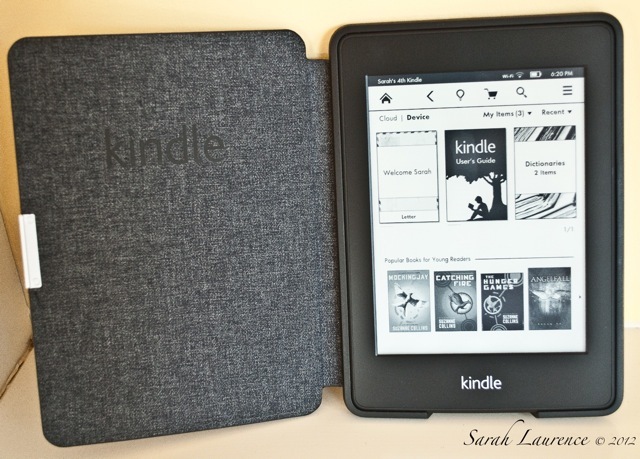 I originally chose the Kindle because Amazon had more titles, and I liked the e-ink. 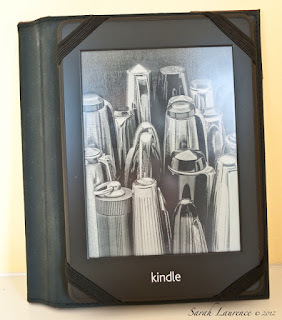 I never did like the original Kindle but when the touchscreen came out, I became a fan, buying an Amazon case with a built-in light. I had wondered about the new paperwhite. Great review. 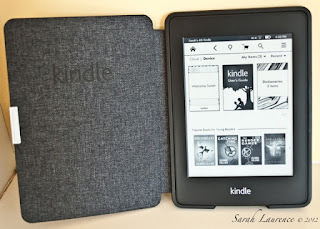 Like you, I still prefer the real thing but a Kindle is perfect for travel and for searching for a particular passage. Love the first photo below of your setup and art supplies on the rocks. Life online: can you be over-connected?